This board nearly got thrown in the scrap pile before I set it aside for a couple months. I started it before I began work on the elephant but when I was a little more than half-way done with it, I wasn’t pleased anymore with how it was turning out. Even a small scratchboard represents a significant investment of time and I’m rarely willing to continue if I feel it won’t be successful. The completed image is a combination of many underlying layers, which if not executed perfectly can adversely affect the finished look I don’t consider that to be quitting, but rather a wise determination that something will not ultimately be worthy of public display. But before I give up I hide it from view for a least a few weeks and come back to it when I’m ready. Often, with fresh eyes, mistakes are more easily corrected and I can wind up with something satisfying. 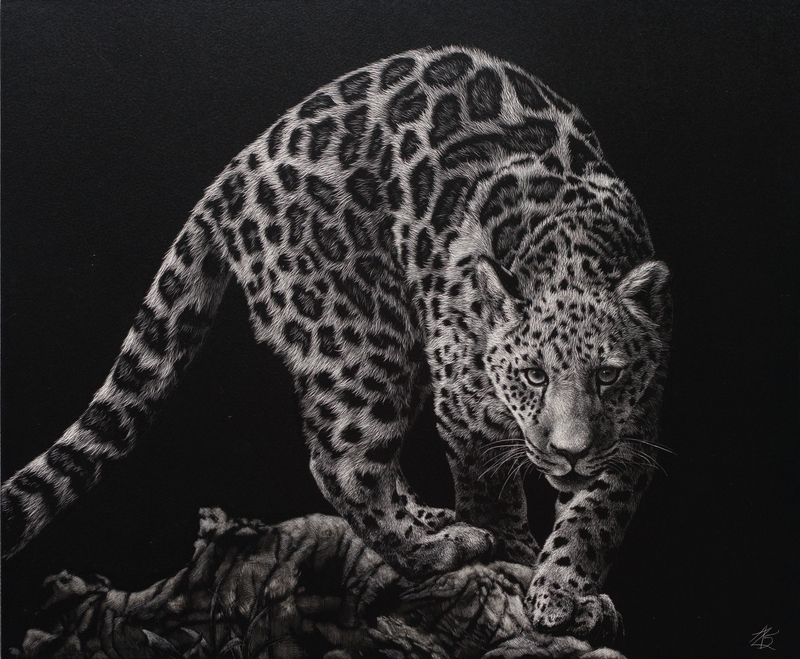 This is a young jaguar, scratchboard, of course and the size is an 8X10.